Soft pastels are her primary focus, but Kristin Pluhacek is also interested in coaching students of all skill levels in the use of charcoal and pencil, acrylic, watercolor and/or oil paint, and fabric collage and quilting as well as combinations of media. 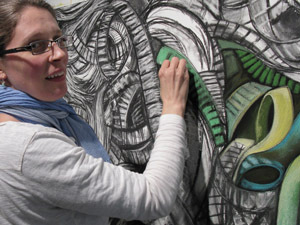 In a residency, Kristin will introduce and demonstrate interesting and innovative ways to use traditional media. Participating students will gain confidence in their own skill as they learn techniques designed for both accurate and expressive representation. Together with students, Kristin will address focused observation and imaginative juxaposition as means to unlock the power of the subject.